Uses of Solar Water Pumps. Solar water pump systems utilise solar photovoltaic (pv) panels to power electric pumps for the movement of water. Applications for solar water pumps range from small scale at the residential level to large scale in agricultural use. Specifically, these systems can be used for domestic water supply, swimming pool/spa filtration, regional community water supply, aquaculture, crop irrigation and livestock watering among other things. Solar watering systems are especially attractive for use at remote agricultural sites where access to the electricity distribution network is not feasible. They present an alternative to wind or diesel powered systems. 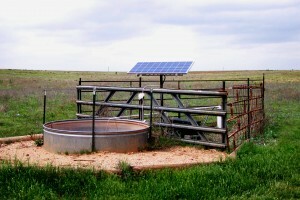 Solar water pumps can be deployed in a variety of configurations. They can provide for irrigation pumping in drip and sprinkler systems or transfer pumping to dams and header tanks. Solar water pumps can also be an economic alternative for watering of cattle on large properties where animals can roam great distances. 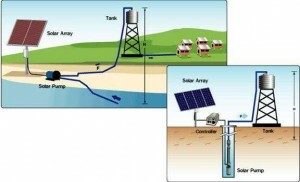 Solar pumping systems are designed to be autonomous. However, they can also incorporate remote control and monitoring capabilities if so required. An electric pump which is composed of an electric motor mated to a water pump. Depending on the water source and destination, the pump can be either of the submersible or surface type. Submersible pumps are most commonly used where water needs to be brought to the surface from large depths, such as in bore wells for instance. Surface pumps are typically used when large volumes of water need to be transferred from one location to another, such as from a river to a crop field or a dam. 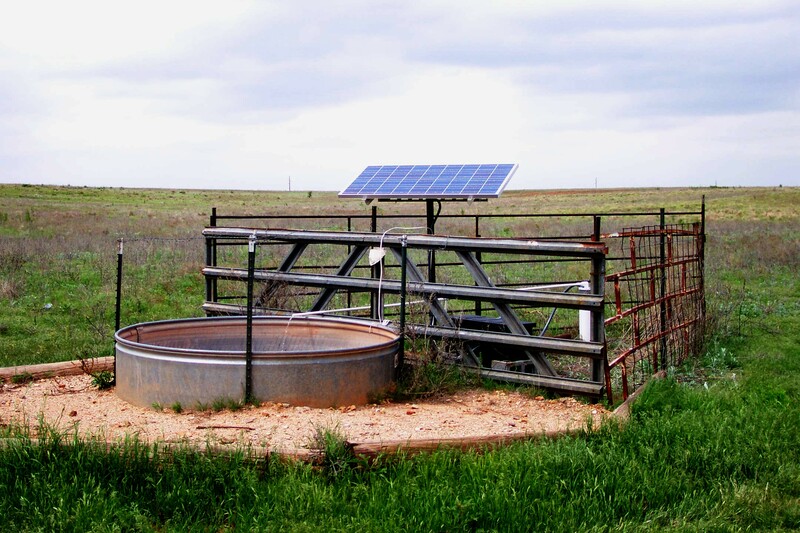 As compared to alternatives, solar water pump systems are an economical means of providing a water supply when the cost of ownership over the lifetime of the system is considered. Solar water pumps can bear a high capital cost. Nevertheless, with an expected lifetime of 20 years, they are also much more long lived than their fossil fuel counterparts. Australian government incentives such as the REC rebate and relatively cheap financing through CEFC sponsored programs can help to ease the burden of their upfront cost. Furthermore, with no fuel requirements and few moving parts, their operational and maintenance costs are minimal. Thus when comparing the total cost of ownership of solar water pumps, they commonly work out to be a fraction of the $/litre of water pumped cost of competing technologies. 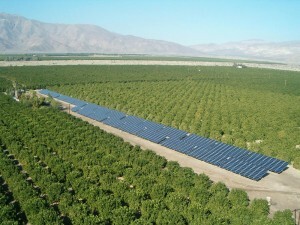 SSS is able to provide turnkey solutions for solar powered watering applications. We bring a wealth of experience to bear. As with our solar pv installations, we only use quality components from reputable brands in the design of our solar pumping systems. We have a culture of transparency with our customers and assist them to make informed decisions. As such, we offer free expert advice so as to be able to provide systems that best meet their needs. Please feel free to contact us to discuss your requirements and for an obligation free quote.